Sunblock clothing is becoming increasingly popular the more people realize just how toxic the sunscreen options are out there. Introducing sun block clothing into your life can help to avoid any mishaps with UV rays during the summer. For both yourself and your children, especially if you are very active outdoors, by dressing every day in UPF clothing, you can reduce the need to continually apply sunscreen. However, the combination of the two is the best possible solution for complete protection, especially if using non-toxic sunscreens. Sunblock clothing - Is any clothing good enough? Most clothing gives me a feeling that I am being protected from the sun's rays but it is actually a fact that the UV rays can penetrate clothing. Summer weight t-shirts and sun dresses can let in an astonishing amount of the sun's damaging UV rays. Different materials vary in their protective capabilities, but as a benchmark a basic item like a white T-shirt generally has an ultra violet protection factor (UPF) of 5. As a minimum for best protection in clothing, a UPF of 30 is recommended. Sunblock clothing by comparison, is not made with any chemicals at all. The UPF is actually provided by the tight weave of the fabric. The resultant UV protection helps to prevent sunburns, premature aging of the skin and skin cancer, in a similar way that sunscreens do. An official rating for sun protective textiles or clothing is the UPF (Ultraviolet Protection Factor). This method is based on guidelines originally established in Australia in 1994. The UPF is a ratio of sunburn-causing UV measured without and with the protection of the fabric. Effectively, a fabric rated UPF 30 means that, if 30 units of UV fall on the fabric, only 1 unit will pass through it. Unlike SPF (Sun Protection Factor) measurements that mostly use sunburn testing on humans, the UPF is measured using a spectrophotometer in a laboratory with an artificially simulated UV light source. 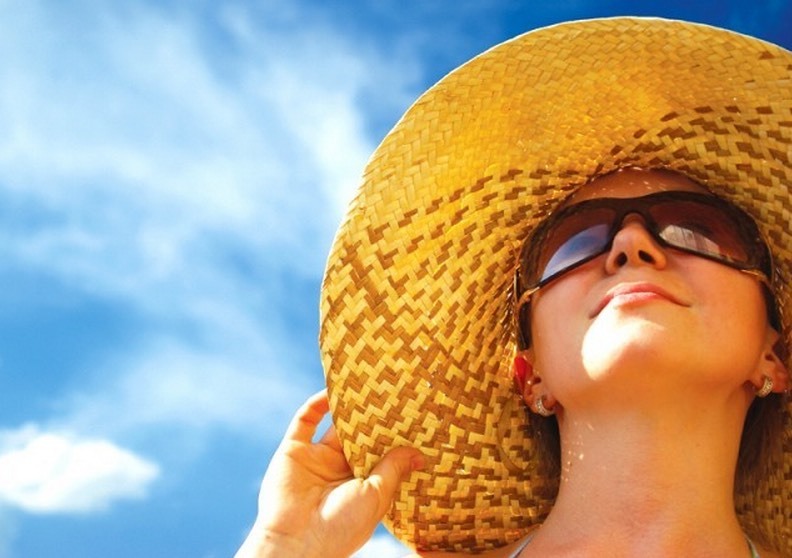 Theoretically, the human SPF testing for sunscreens and the instrument UPF testing both generate comparable measurements of the different product's ability to protect against sunburn. A manufacturer may publish a test result to a maximum of UPF 50+. The average is UPF 30. Tests have shown that wearing regular cotton while wet results in the fabric losing half of its original UPF/SPF rating, whereas clothing with a UPF rating is able to retain the majority of this original rating while wet.